Just west of the FAA tower here at EAA Airventure Oshkosh is a collection of pavilions that could well be considered to be the epicenter of the show. It is not as flashy as Boeing Plaza, or as historic as the rows of Vintage airplanes, and certainly not as much fun as Camp Scholler. But when it comes to building a more solid foundation for aviation well into the next few decades, you’ll be hard-pressed to find a more important part of this show than Aviation Gateway Park. This is where innovation is on display at AirVenture. If it’s a new, developing technology, you’ll find it at Aviation Gateway Park. But the real stars of this part of the show are the many universities that exhibit here looking for new students to fill the current and future empty right seats of regional airlines or fill the need for many other positions in the aviation industry. But the focus is on pilot training, because without the collegiate programs producing new qualified pilots that the airlines can hire, airliners will get parked, and service to smaller markets will dwindle. When that happens, we all lose. All the major universities are here at Aviation Gateway Park, but LeTourneau University stands out to me, not because they are the biggest in the country, but because they have dedicated their mission to providing quality education and aviation training since 1956. In my world, you do not last 62 years doing anything unless you do it right. They are a great example of the many collegiate programs exhibiting at AirVenture, and a peek inside the LeTourneau tent at AirVenture will reveal just what the university path looks like if aviation is your chosen career. Airplanista sat down with LeTourneau’s Bruce A. Chase, Chair of their Flight Science Department, to dig into the university’s backstory, and also uncover some solid intel on just what this career path looks like. There is a lot of great info here, so this interview will be presented in two parts, both coming during AirVenture. 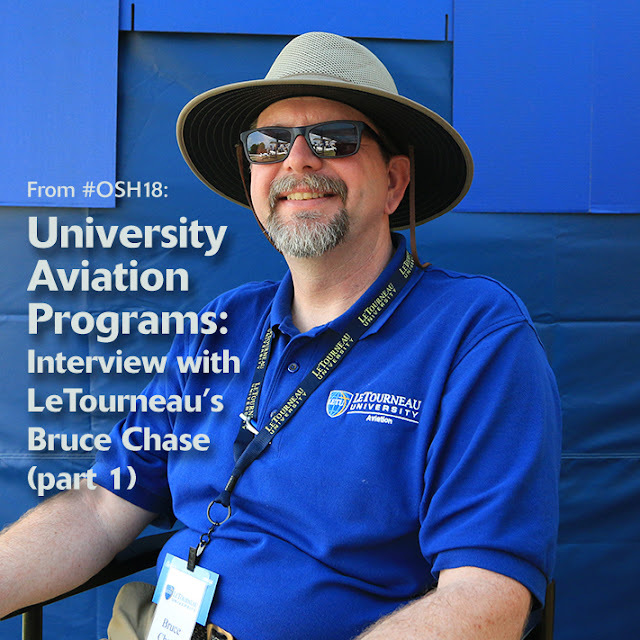 In part one, we meet Chase and LeTourneau University, learn about what exhibiting at AirVenture is all about in terms of logistics, and read about the details of their Flight Science Department. And in part two, I will conclude this interview series with some plain truth about what taking the university path to an aviation career looks like, in terms of time, dollars, and rewards. AIRPLANISTA: Please give me your name, title, and any aviation experience such as hours, ratings, certificates and type ratings. CHASE: Bruce A. Chase Chair, Flight Science Department, ATP AMEL, Commercial ASEL, Flight Instructor Airplane Single, Multi, and Instrument, Advanced and Instrument Ground Instructor. Twenty-six years of flight instruction experience. Over 8,100 hours total flight time. Over 6,000 hours of flight instruction and 2,400 hours of instrument instruction given. Airframe and Powerplant Mechanic. AIRPLANISTA: Introduce my readers to LeTourneau University’s (LETU) College of Aviation & Aeronautical Science. Give me a capsule summary of what you offer in terms of programs, degree tracks and enrollment numbers. CHASE: LeTourneau University was founded in 1946 by renowned inventor and businessman, Mr. R.G. LeTourneau. Ten years later, in 1956, LeTourneau Aviation was born. For over 60 years now, LeTourneau University has been training mechanics, pilots, mission aviation professionals, and now aircraft dispatchers, UAV pilots and technicians, and industry managers in a caring Christian environment. Today, we serve just over 300 aviation students between our main campus facility in Longview, TX and our satellite facility in McKinney, TX. LeTourneau University provides education across our more than 140 undergraduate and Master’s degree programs. Our dual credit programs have had more than 3,000 students that come from 46 states, and 29 different nations. These programs include degrees in the fields of engineering, aviation, nursing, business, education, and much more. AIRPLANISTA: How important is being an exhibitor at EAA AirVenture Oshkosh to your overall recruiting plan? CHASE: AirVenture is an excellent opportunity for us to recruit students and connect with alumni, mission organizations, employers, and other collegiate programs. Our preparation for AirVenture 2018 began shortly after returning from AirVenture 2017. This year we brought a team of nine, and countless hours have gone into our preparation. AIRPLANISTA: What are the logistics of exhibiting here in terms of exhibit airplanes, housing and food? CHASE: We brought our Seminole and Citabria here from Texas, and had some issues getting the Citabria in. As far as housing, we have an alumni that lives in the area, and he opens his house to us so most of our team stays there, and there’s a Mission Aviation Support Association (MASA) here that provides meals. The real work is simply setting up the tent and booth area, deciding what brochures are we going to bring, how we want to display the aircraft, and how we want the actual booth area to look. AIRPLANISTA: What would a successful show look like to you? CHASE: EAA AirVenture Oshkosh is a great opportunity for us to talk with prospective students. We always have several college-age students who come by actively looking for information on collegiate aviation programs, and also a fair number of students who did not even know universities were here at the show or that we offered aviation programs. So it is a great show to introduce them to our program. AIRPLANISTA: Your sign out front says you are a “Christian Polytechnic University.” Explain the Christian aspect of LeTourneau. CHASE: Yes, there are required Bible and Theology classes, but we do not require an agreement with a Statement of Faith. We have had students from many different religions, but we are a Christian institution. We wear that proudly, we talk about it in class, and it flows through everything we do. AIRPLANISTA: Let’s talk about LETU’s fleet. What makes/models do you fly, and how many of each? AIRPLANISTA: How critical are university aviation programs like LETU’s to filling the pilot pipeline into regional carriers and part 135 operators? And, if these collegiate programs did not exist, what would happen to the aviation industry as senior Captains age out of the system? CHASE: In today’s industry, university aviation programs are vital to the future of the aviation industry. University programs offer training that is intentionally focused on building professionals. On the modern flight deck, it is important to have pilots that are not only competent at the job at hand, but pilots that are adaptable to ever changing technology while rooted in basic flying skills. The hangar floor demands no less from maintenance professionals. Our program strives to build a strong foundation for a career and leadership in aviation. As focus on a college degree increases in America, and increases in the aviation industry, the spotlight will continue to shine on collegiate aviation programs as airlines, corporate flight departments, manufacturers, and other entities within our industry seek to pull professionals into the workforce. Together as an industry though, we can all do our part to help secure our future by taking opportunities to introduce the next generation to flying. Most of us could relate to some story from our childhood where we first caught the aviation bug. As an industry, we must instill a love for aviation in those at a young age. It will take everyone, and not just collegiate programs, to fill the seats needed by companies in our industry not only here in the United States, but around the world as global aviation demand continues to rise. One of the best places to start is right here at AirVenture this week by taking the extra time to show around our airplanes to those interested in learning more. AIRPLANISTA: According to your website, your Restricted ATP program “allows graduates the ability to qualify for airline employment at a fast-tracked 1,000 hours total flight time.” Please explain how your program(s) helps a pilot get into the trade without having to log the required 1,500 hours. CHASE: The Restricted ATP program allows graduates from an approved 4-year degree program to earn the Restricted ATP certificate with 1,000 hours of total time. Graduates from an approved 2-year degree program can receive the Restricted ATP with 1,250 hours. Currently, we have 16 approved 4-year degrees. It’s not just the airlines that benefit from having a steady flow of new pilots coming into the system. Airplane manufacturers are also stakeholders here, which explains why Piper Aircraft is the main sponsor of Aviation Gateway Park. They see what everyone in the industry sees, a lot of gray hair flying a smaller and older fleet, and being part of this very critical part of AirVenture is Piper’s way of doing something about it. We all know that new student pilots eventually get their ticket and become new private pilots, and many end up as airplane owners. As they progress through the years flying used airplanes, it is Piper’s hope that some of these new pilots who had their fire lit at Aviation Gateway Park end up ordering brand new airplanes from them at some point, which will of course complete this circle. Stay tuned right here on Airplanista at AirVenture for part two of this interview series with Bruce Chase of LeTourneau University. I think you will find it both enjoyable and educational.